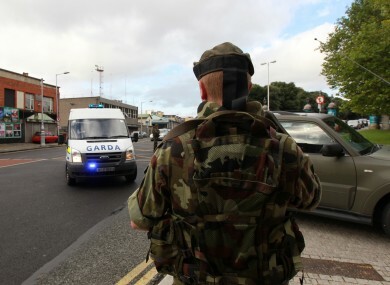 A CONFERENCE ON the future of Ireland’s defence forces has heard the daily difficulties faced by members – including taking days off because they cannot afford to travel to work. A recent report into the wellbeing of the Defence Forces found that 52% are dissatisfied with military life and over 3/4 of those surveyed said that they felt obliged to search for a job elsewhere. Mark Scally, President of the Permanent Defence Force Other Ranks Representative Association (PDFORRA) told TheJournal.ie that forces are “losing” members a year or two after entering the service. There was a delegate down here speaking yesterday. He spent two years in the defence forces, and he’s now leaving now to join the gardaí. He then said that leaving soon after entering the service was a common course of action, even though they “love being a soldier and are dedicated to serve country”. It’s a pity – especially in this historic year. The ‘Your Say’ Climate Survey 2015 at first asked people to voluntarily take part in the survey, but didn’t receive enough responses. So members of the military were ‘detailed to do it’ – resulting in a wider spectrum of participants from all over the country. There are currently approximately 9,000 members in the Defence Forces called Óglaigh na hÉireann, which encompasses the air corps and naval service. The Defence Forces acknowledged that there were ‘challenges’ ahead of them, but that it is through pinpointing problems in the survey that they will be resolved. At the conference in Cork which is on all this week, members of the Defence Force have been sharing some of the issues faced by soldiers – the youngest members being less advantaged. Over 75% of those surveyed disagreed that the pay is fair. Members who joined the Defence Forces in 2011 and afterwards are paid just over €20,000 a year, and will get €25 extra on top of their normal pay if they complete a 24-hour shift. According to Scally, 20% of the Defence Forces avails of the family income supplement and the average take home pay for younger members is just €300 a week. The Minister is committed to ensuring that members of the [Defence Forces] are fully recompensed fairly and transparently in the same manner as the members of all other associations who have signed up to the Lansdowne Road Agreement (LRA). A further 27% of soldiers have considered leaving because of the commute to work. Most of our members would face a long commute – and that’s fine if they’re getting good money, but they’re not. He also says that retention rates at the navy are particularly bad – with pay below the minimum wage despite seamen being out at sea for months at a time. I’ve been saying it at conferences for years – but it is worse than I thought. The survey also showed that there is a “drastic lack of justice”in the Irish Defence Forces across four different areas: paying conditions; disciplinary procedures; dignity and respect in the workplace; and information on changes to policy. Members failed the system drastically on all four of these. In terms of discipline and respect, Scally acknowledges that this is not an issue of a lack of funding and says that there have been efforts to address these. There was a judgement recently where a female soldier won a High Court case in relation to promotion. The judge in question said himself that the whole system in the military is outdated. A spokesperson for the Defence Forces said that they were implementing best practice of asking their members “what they would like to be improved, and doing what they can to address it”. They acknowledged the criticisms that were being made at the conference, saying that attempts were being made to improve conditions – including alleviating stress levels of soldiers. 16% of soldiers reported that they regularly feel stressed. It’s really worrying when one in seven of a group has access to weapons. Email “"Soldiers can’t afford fuel for 5 days a week - some take a day’s leave to save them the trip"”. Feedback on “"Soldiers can’t afford fuel for 5 days a week - some take a day’s leave to save them the trip"”.